Ask The Bellwether: Can you spin a sheep? I get asked this a lot, actually. And, perhaps you are curious. As you can see from the photo, some of the spindles I carry are sheep shapes. Made by Mr. Forrester, they are gorgeous cuts of wood. And, yes, they spin. 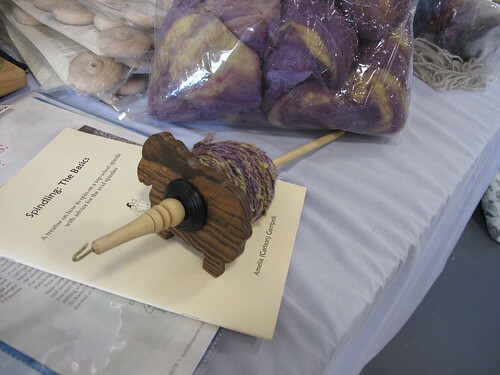 See, I even spun singles and plied on this sheep -- it does it all! Why don't they wobble? Well, at first, I was getting all complicated in my head about balance and cut and how Mr. Forrester must have really studied the shape. And then, like Archimedes in the tub, I thought, "Eureka!" it's not that complicated after all. It's the center of mass that matters. If Mr. Forrester locates that in his sheep and puts the shaft there, then the sheep will spin without wobble. That's why we can spin with a simple rock on a string -- it will rotate and center the string so it can spin with the string coming away from the side of the rock in a way that places the rock's center of mass below the string. Simple. We can have spindles of pretty much any shape. And, do you know what happens when you twirl them? They all blur into circles. I guess that's why we think only circles can spin -- visually, all our shapes become circles when they are in motion. It is only fitting that it is the eve of the availability of my new book, Productive Spindling, arriving July 15th, and I've figured out a new nugget not in the book (this nugget, that is). If you are ordering my new book, consider adding a Forrester Geometric spindle or Sheep spindle to support The Bellwether and expand your own spindle collection. I love the sheep spindle I bought from you earlier this year :), it's spins wonderfully.